K-State researchers Sunanda Dissanayake, associate professor of civil engineering, and Litao Liu, graduate student in civil engineering, have studied the actual speeds on Kansas gravel roads and the various factors involved. "We found that people are driving at speeds based on their perceptions and existing conditions – regardless of the speed limit," said Dissanayake, who also is a faculty member with K-State's University Transportation Center. Kansas has about 78,000 miles of gravel roads, or 58 percent of all roads in the state, she said. By state law, gravel roads have a speed limit of 55 mph, though local governments are allowed to reduce the speed limit within their jurisdictions. Most of the state's 105 counties maintain the 55 mph speed limit and don't post the limit on gravel roads. 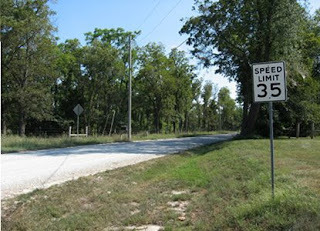 One exception is Johnson County, where the gravel road speed limit has been reduced to 35 mph and signs are posted. Dissanayake said this creates problems since the county is the only one in the area with that speed limit. For instance, when driving on a gravel road in Miami County, the speed limit is 55 mph -- and it's not posted. However, when staying on the same road and passing into Johnson County, signs alert drivers that the speed limit is 35 mph. She said the Kansas Department of Transportation wanted to know the better approach in setting speed limits on gravel roads. The study also is important for county engineers who face complaints from county residents who ask for the speed limit to be lowered. For the project, the researchers collected speed data on Kansas gravel roads. They used automatic traffic counters that collect the speed of drivers without them knowing. The researchers monitored 41 sites, each for about one week. They looked to see if there was a difference between actual driving speeds and the speed limit. The researchers also looked at various factors like the different types of gravel roads; the number of crashes on the gravel roads; the width of the roads; the amount of heavy vehicles and traffic parameters like volume. Additionally, the researchers sent surveys to residents living near gravel roads. Dissanayake said the project only looked at straight sections of roadways and avoided curves, slopes, bridges and other factors that likely would affect the drivers' speeds. An example is the gravel roadways in Johnson County and Miami County. The study found that though two speed limits exist, the driving characteristics were the same. While Johnson County's speed limit is 35 mph and posted, the average actual speed of 37.5 mph was higher than the average actual speed of 35.8 mph in Miami County, where the speed limit is 55 mph and not posted. "Johnson County does not gain anything by lowering the speed limit and posting it," she said. "Spending money on posting and maintaining signs in this aspect is pointless, really." Dissanayake said the study shows that people drive at a speed at which they are comfortable. She said an additional factor is that people know gravel roads are not highly enforced by police. In addition, the study found no safety benefit to posting speed limit signs or reducing the speed limit on gravel roads, as there was not a large difference in the number of crashes or the types of crashes. From the drivers' surveys, Dissanayake said those who live next to gravel roads know what the speed limit is, and they drive at a speed at which they are comfortable. The researchers recommend that the practice of lowering speed limits and posting signs on gravel roads in Kansas not be adopted in new situations. However, Dissanayake said the researchers have not made recommendations for past practices, such as in Johnson County. "I can't say there is any harm in the posting," she said. "The only thing is that you might lose the respect of the drivers. The majority are driving under the speed limit, so why do you need to lower it?" She said the study is exclusive to gravel roads and cannot be generalized for other roads. The research will be presented April 14 at the Kansas Transportation Engineering Conference at K-State. It also was presented in January at the Transportation Research Board Annual Meeting in Washington. D.C. Project funding was given by the K-TRAN program of the Kansas Department of Transportation.